Between pine and oak trees, with a fresh terrace and just 150m from the beach! Located on the main road of Tamariu, about 150 meters from the beach. Located between pine and oak trees, it has a large terrace right next to the living room and 3 bedrooms. Very fresh during summer and it also has a fireplace for winter time! Apartment located on the entrance to Tamariu road about 150 meters from the beach. It has a covered terrace in an environment of pines, where there is a large wooden table to eat. The apartment is part of a recently renovated old house. It is a very cool apartment in the summer and has a fireplace for winter. The house has three bedrooms: one double and two twin beds. Fully equipped bathroom with tub. There is a bakery opposite and a supermarket a little further down. We are available to take care of any problems that may arise during your stay. Tamariu is an old fishing village with a central beach and two small beaches at each side. It is one of the three beaches that belong to the town of Palafrugell together with Llafranc and Calella. The walk along the beach is lined with several bars and restaurants, and some small shops. There are three small supermarkets, a couple of bakeries and some places where they prepare take-away meals, sandwiches and pizzas. On the beach there is a kayak rental place where they also offer guided tours with small canoes for small groups of people. There is also a boat rental agency that offer diverse types and sizes of boats with which you can go surfing nearby and explore the many coves and small beaches that surround Tamariu. The dirt path named "Camí de Ronda", which covers much of the Costa Brava along the coast cliffs, leads us to beautiful and hidden places to enjoy nature in a greater and quieter way than in the crowded beaches. There is an important and consolidated diving school on the main beach: a great experience to go for with "Diving Stolly's". You can also enjoy the area by cycling from town to town through the gorgeous natural dirt paths that connect them. There are also several places to go play activities such as archery (near the village of Esclanyà), horse riding in many horse riding places in the area, playing golf, sightseeing with visits to Iberian and medieval settlements nearby... There are also other possibilities that we will be happy to let you know about if you are interested. Tamariu is a familiar beach so nights tend to be quiet. Most people simply go have dinner by the sea, on the boulevard's restaurants, or choose to go enjoy a "cremat" drink, made out of rum and cinnamon burned up in flames, and orange slices. Summer evenings in Tamariu (mostly the traditional festivities such as 15th of August) tend to be accompanied by the folk Habaneras music as a background. If you are looking for clubs or discos, Tamariu is not the spot... to find this, you will have to go to Calella or Llafranc, Begur... where you'll find more nightlife spirit. Lindo pueblo, buena gente, muy tranquilo. Muy buenas playas. Ideal para descansar. El apartamento se encuentra bien ubicado, con espacio suficiente y con una terraza muy agradable. Como puntos negativos, lamentaría que en el apartamento superior escuchábamos carreras y juegos de niños muy pronto(7am), simplemete sería mala suerte en la coincidencia de fechas con el apartamento superior. Además, creo que una renovación de los colchones por otros más confortables sería bueno. En general buena estancia y días en Tamariu. Saludos. The apartment was rather basic but we felt it was fine for the price we paid. 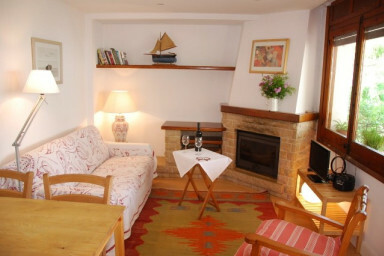 It is in an excellent location and we had a very enjoyable stay. Many Thanks. La maison n'est pas désagréable mais située au bord de la route principale de Tamariu, dans un virage (Bruit et odeur d'essence), et de plus extrêmement humide. Avec des enfants de 2 et 6 ans nous ne sommes pas restés les deux nuits prévues. Tamariu is a wonderful place and we found a convenient and functional location near the town center and beach for our week there. Everything worked and the support and service of the broker was excellent.